Akbar the Great sent a delegation to Goa in 1578, requesting the Portuguese Viceroy to send a team of learned Catholic priests to his Ibadat Khana in Fatehpur-Sikri, where he held discussions on religions. On November 17, 1579, the Viceroy and the Jesuit Provincial in Goa selected three priests for his court. The three set out from Goa. They travelled by primitive modes of transport and arrived at Fatehpur-Sikri on February 28, 1580. Akbar received from them a copy of the Bible with profound reverence. But he did not convert despite the best efforts of the priests, though his son and grandson continued to patronize them off and on. The Jesuit Mission was entrusted to the Carmelities after 1773. Two Carmelities from Bombay, Fr Agnelo di San Giuseppe and Fr. Gregorio della Presentation, took charge of it. Fr Agnelo stayed for a little while before he left. Fr Gregorio worked in Delhi for a longer period under the Capuchins. He died on 29 September, 1807. The Mission of North India had started with the Mughal Court of Akbar. However, the purpose of the mission was restricted to discussions on religious tenets. After the reign of Jehangir the mission of the Jesuits moved out of Agra and spread its wings to such far off regions of the Indian subcontinent as the Tibet Hindustan Mission in 1760. The priests posted at Sardhana near Meerut and held services in the palace of Begum Samru (ruler of Sardhana), who also gave hospitatlity to the visiting chaplain, who resided in Delhi. In 1703, Propaganda Fide established the Prefecture of Tibet Hindustan and entrusted it to the Capuchin Fathers of the Italian Province of Picenum. The first group of Capuchins reached Tibet from Kathmandu in 1707 and started working there. The mission operated from Lhasa for about four decades until a religious persecution forced the priests to give up their mission in April 1745 and return to Kathmandu. The Mission of Nepal was abandoned in 1769, following an invasion. The Capuchin Fathers then settled down at Chuhari, near Bettiah in Bihar. In 1820 the Vicariate Apostolic of Tibet-Hindustan was constituted and in 1845 it was renamed Vicariate Apostolic of Agra. On February 7 the same year it was bifurcated to form two Vicariates: Agra and Patna. Monsignor Maria Zenobio Benucci was made the first Vicar Apostolic of Agra, which embraced the whole of North India from Sind to Bengal; earlier in 1723, Fr Ippolyto Desideri of Tibet-Hindustan Mission was posted in Delhi. He built a church and dedicated it to the Virgin Mary. The church was blessed on All Souls’ Day (2 November) the same year. That was the beginning of the first Catholic Church in Delhi. The Sacred Heart Cathedral was only the second one. The gap between the construction of St Mary’s Church, built after the “Mutiny” by Fr William Keegan, and Sacred Heart Cathedral was 70 years. On February 11, 1919 the junior bishop to Archbishop Raphael of Agra, Dr Evangelisti Vanni sent Fr Luke Vannucci to Delhi as parish priest of St Mary’s Church and Chaplain to the British Armed forces garrisoned there. After getting the blessing of the saintly Padre Pio he arrived in Delhi in April 1919. During the year of his arrival itself Fr Luke renovated St Mary’s Church and the Rectory in Old Delhi. In 1920 he purchased the plot of land wherein stands the Cathedral of the Sacred Heart. However, it was not called a Cathedral. Neither Fr. 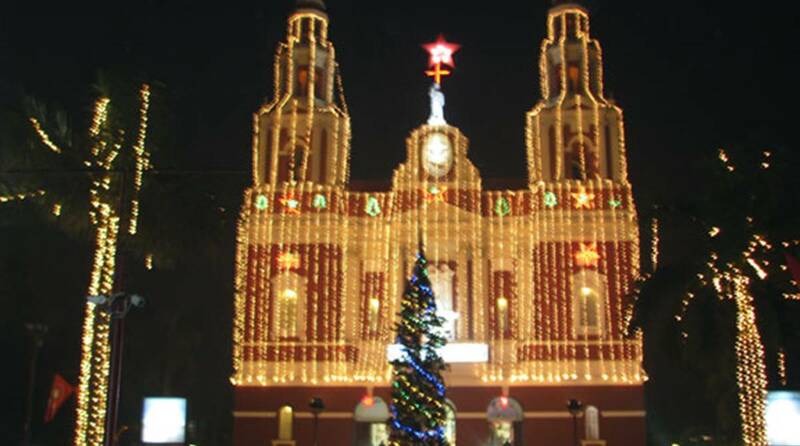 Luke nor Archbishop Vanni had known that Delhi would become a diocese of its own right and the church they built would take its place in history as its Cathedral. Father Luke Vannucci brought the land in 1922. The plot measured 14,022 acres. The then government leased it in perpetuity to Agra Archdiocese for a onsideration of Rs 7,000 and the Archdiocese of Delhi, which inherited the land, pays annual ground rent for it now. Fr Luke was indebted to many generous persons, among them the Vicerine Lady Willingdon. Sir Malcom Hailey, Governor of the United Provinces, helped him to obtain an interest-free loan of Rs 60,000. Eight architects were invited to submit plans for the Cathedral and Sir Edward Lutyens consented to be on the panel of the jury. The plan submitted by Henry Medd was finally selected. Archbishop Vanni blessed the land and laid the foundation stone in 1929 and construction started in 1930 and completed in 1935. By an error of judgement the foundation was laid too close to the boundary of the property. The General Post Office, now known as Gol Dak Khana, was coming up in front, which had a plan to build more than one floor and the officers’ quarters around it. The Cathedral was unwittingly posed to be placed in the midst of a concrete jungle Fr Luke approached Lady Willington. She intervened to alter the plan of the Post Office. Her suggestion to the town planners to shift the residential complex from the vicinity was accepted and complied with. She also let Fr Luke acquire an extra 6137 sq yards of land for an approach road. The subsidy from the Archdiocese of Agra was insufficient. Fr Luke was hard pressed for finances. He approached prominent citizens of Delhi as well as benefactors in his native Italy seeking financial assistance. As the obituary write-up on Fr Luke preserved in the archives of Tuscani Province in Italy suggested he made use of the “media” of his time to solicit donations. A bronze plaque inside the Cathedral bears the names of those benefactors, who donated more than Rs 1000, which, of course, was a significant sum of money in the 1930s. The Patrician Brothers of Musooree and the Religious of Jesus and Mary also donated this sum. However, more amazing is the donation of a certain Rev Dhuram, who was a Minister of the Anglican Church and served the British Army as a chaplain. He accepted Catholic faith before his death and bequeathed to the Cathedral a sum of Rs 13,792. Another marble plaque near the main entrance bears the names of Sir Anthony S De Mello, KGSG and his wife Rita, as benefactors from the laying of foundation to its inauguration. for him and his mission. Just like St Joseph, who received the Angel’s message in the dead of night, he obeyed. He withdrew his building fund from the Alliance Bank. A bankruptcy procedure on the bank was in progress unknown to Fr Luke or for that matter to any ordinary citizen. The day after, the bank indeed crashed. Apparently the young man who delivered the message and the benefactor from Japan who remembered Fr. Luke and his Cathedral after 15 years were expressions of God’s providence for his servant Luke. And Fr Luke responded with adequate faith. Sir Anthony de Mello donated the main altar of pure Carrara marble to the church and Archbishop Vanni donated the bell, vestments and furniture in the sanctuary, including the imposing “Cathedra”, the seat of the Archbishop signifying his teaching authority. It is from the word “Cathedra” that “Cathedral” is derived. Prayers and sacrifices of many went into the completion of the Sacred Heart Cathedral. After five years the Cathedral was completed. It was blessed on 8 December, 1935, by the Papal Internuncio. His Excellency Rt Rev Leo Kierkels, in the presence of six other bishops and a large congregation from many faith traditions, priests and men and women religious. The Cathedral complex now comprises Maria Bhavan, Convent of Jesus and Mary, St Columba’s School, Presbytery of Parish Clergy, Archbishop’s House, Diocesan Community Centrecum-library, Aradhana, Sister’s Convent of Pious Disciples, and Yusuf Sadan. Pope John Paul II visited the Cathedral in 1986 and 1999. Now a statue of the late Pope stands near the main gate, not far from the Grotto of Our Lady of Lourdes, which attracts many non Christians on Christmas, New Years’s, Easter other feast days and Sundays. Fr Kuriapilly, however, has not mentioned that the Cathedral could have actually come up in Delhi Cantonment, where land for it was donated by a European Commander of Maharaja Scindia’s forces, as large areas in Delhi were still in the possession of Gwalior State since the time of the Mughals. As a matter of fact, Madhadji Scindia was the virtual ruler during the later reign of Shah Alam as he had taken the “Blind Emperor” under his protection in the 18th century. So the Marathas were the controlling force in Delhi. Serving them were several Europeans, among them Gen de Boigne, Gen Perron, Capt Pedron, Col Salvador Smith, Col Skinner, an Anglo-Indian, and the Italian Antonio Reghilini, architect of Begum Samru’s church in Sardhana, and, of course, the Commander. However, the British wanted to build a cantonment for their troops on the land leased by the Scindias to the Commander. So they gave him the option of taking the same size plot (enlarged by Fr Luke’s efforts) in the new Capital of Raisina, and that happened to be the one on which the Cathedral came up. Incidentally, the spot where Maria Bhavan is situated was once the bungalow of the Ranger of Raisina Forest, around which wild animals roamed about. Just imagine where now the church bells chime and hymns are sung during Mass the wailing howls of the wolves, the unnerving laugh of the hyena and the bone-chilling cries of jackals rent the air both by day and night! Isn’t then the big change in the ambience of the Cathedral cause for wonder? Fr. Kuriapilly may well be mumbling, “Praise the Lord” as he crosses himself during daily Mass.